This topic contains 3 replies, has 3 voices, and was last updated by Eric Weller Aug 4, 2014 at 10:33 am. Last fall we had such great success on big browns with micro zonkers tied with Pine Squirrel, that I stocked up on a bunch of Pine Squirrel skins over the winter. This spring, un-weighted micro zonkers and heavy sink tips proved to be the ticket for big fish on the Missouri during high-water. The Pine Squirrel streamer (Pine Squirrel tail and wrapped body) is not a new idea, but I thought I’d adapt the material to the traditional Woolly Bugger pattern. For smaller buggers, I am still using dubbed bodies, but for #6 and #4 buggers, the Pine Squirrel is proving to be very effective. I rarely fish streamers with anything but a 7 or 5 weight (200 or 150 grain) 30 foot sink tip and short, stout tippet. These lines can be fished effectively even in shallow water if you pay attention. There biggest advantage is that you can get lightly or un-weighted flies deep with short leaders without fear of heavy beads, cones or dumbbells dinging your expensive fly rod on errant casts. Plus, un-weighted flies are much easier to cast at distance accurately and behave more naturally in the water. The Pine Squirrel Woolly bugger is pretty much traditional construction with the exception of the body. Since Pine Squirrel can be found in black, brown and olive shades, it is perfect for buggers. For the tail, I layer various flash and marabou making sure the marabou butts extend close to the hook eye to provide a good base for the Pine Squirrel body. For clearer water and more subtle appearance, I always have a few tied without a lot of flash, but replaced with rubber. I started tying these with typical saddle hackle, but their effectiveness caught so many fish, the hackle eventually broke. I replaced the hackle with wire instead. Now, a couple of dozen fish might wear down the squirrel fur a bit, but the fly remains intact. I use bright orange thread so the head wraps create a “hotspot” which can be effective in getting fish to strike. Once the tailing is in place and the underbody formed, the wire and Pine Squirrel strip are tied in. The squirrel strip is tied in skin up right at the base of the tail. I put a small amount of gel-based super glue on the hook shank and wrap the squirrel forward just short of the hook eye. Take care not to overlap the skin or get fur in the glue. Tie off the squirrel strip and wind the wire forward like traditional ribbing. I always take a couple of extra turns of wire at the hook eye to form a base for the head. Wrap the head, secure and cement with your favorite stuff. In the water these buggers are alive. 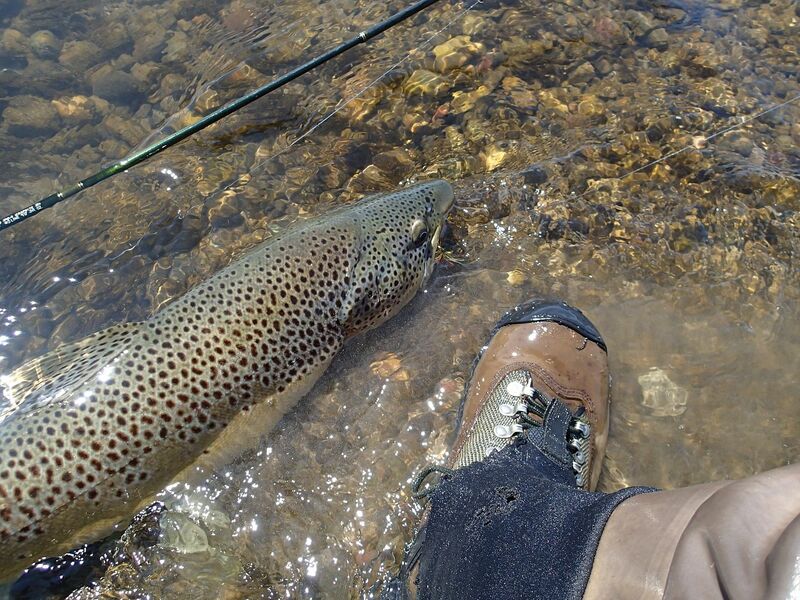 Just the other day, a nice brown trout came to hand in the Madison River on one of these buggers. Instead of puking up the traditional half dissolved fish, this brown was puking up live #6 olive brown leeches—almost an exact imitation of the fly I was using. I could say I can’t wait until the fall to use these buggers on fall browns, but I don’t have to, they are working on big browns already. This brute of a fish was caught mid-day, during sunny conditions at the mouth of a spring creek on public water. Dozens of fish were feeding on PMDs in the shallow creek mouth as it entered the river. I dropped the bugger into the pod from across the river. It was as if I had snagged a log. When the brown came to hand, it taped 26 ½ inches. A smaller, 19” brown came out of the same pod minutes later. 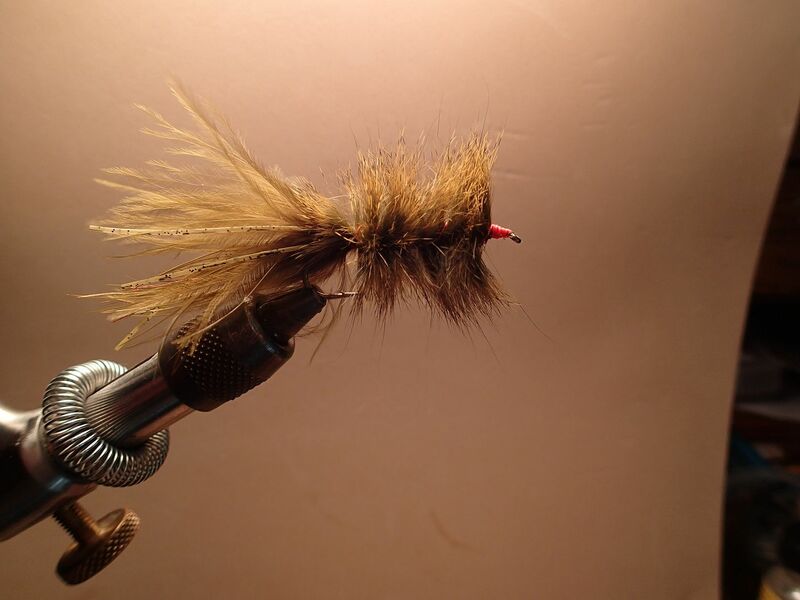 The Pine Squirrel Woolly Bugger works (on rainbows and cutts as well). Great fish Mike. I received a fly similar to the one you showed above in a fly swap years ago (through this forum actually, I think). I still haven’t given it a proper swim, but will have to make a point of doing so now. I already have our group tying them Mike.